Low power consumption less than 1 watt. Saving of more than 30% over conventional meters. LED's indication for current reversal tampering and phase availability. Meter works accurately under earth load condition. It is available in Two Wire & accuracy class-1. Immune to effects of external magnetic field as per IS : 13779. HPL 10-60A Single Phase LCD Energy Meter, SPPB1510000 is a premium quality Energy Meters from HPL. Moglix is a well-known ecommerce platform for qualitative range of Energy Meters. All HPL 10-60A Single Phase LCD Energy Meter, SPPB1510000 are manufactured by using quality assured material and advanced techniques, which make them up to the standard in this highly challenging field. The materials utilized to manufacture HPL 10-60A Single Phase LCD Energy Meter, SPPB1510000, are sourced from the most reliable and official Energy Meters vendors, chosen after performing detailed market surveys. Thus, HPL products are widely acknowledged in the market for their high quality. 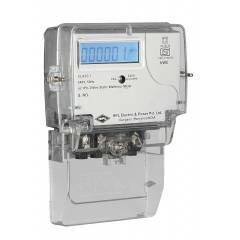 We are dedicatedly involved in providing an excellent quality array of HPL Energy Meters.